Is Mercedes Planning A Baby G Wagon? This G Wagon-lite will likely be called the GLB. Way back in 2014, we heard rumors that Mercedes-Benz wanted to release a smaller, more compact, version of the G-Class by 2019. This new model was set to be called the GLB, and would sit above the GLA in the lineup. It seems like this news may not have just been a rumor. Right on schedule for a 2019 reveal, Autocar just reported that Mercedes has submitted trademark filing for 200, 220 and 250-badged versions of the GLB. The GLB will likely share engines with the A-Class, GLA and CLA when it is eventually revealed. If Mercedes used the current engines from its entry range, this would mean a 2.0-liter turbocharged four-cylinder with 208 hp and 258 lb-ft of torque or 375 hp and 350 lb-ft of torque in AMG 45 tune. In Europe, the GLB would likely receive Renault-Nissan-sourced four-cylinder gas and diesel engines ranging from 160 hp to over 300 hp. The latter 300-hp model may come in the form of a mild hybrid AMG 35 drivetrain that will be shared with the upcoming A-Class. We absolutely love the idea of a baby G-Class in the Mercedes range. Despite being highly outdated, the G-Class in an icon and a status symbol. A smaller version could bring the G-Class status to people on a real-world budget. We expect that the GLB will be more expensive than the GLA, which starts at $33,400. However, it will likely cost less than the larger GLC, which starts at $40,050. The styling should draw inspiration from the Ener-G-Force concept that was shown at the 2015 LA Auto Show. Like the G-Class, the GLB will have old-school military style, but will combine it with modern design cues. This could end up being a very exciting SUV from Mercedes-Benz that finally offers the cool factor of the G-Class at an affordable price. 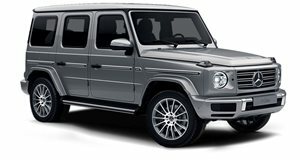 It may not look like it on the surface, but this is the most important G-Class ever.